BOOKTRYST: "A Proud Non-Reader of Books"
If you, like me, hang on the words of celebrities, completely dependent upon the wisdom of our betters for guidance in matters of life and love, then the gold that fell from the mouth of Grammy Award-winner, Kanye West, the other day was bling to the ears of those of us who have struggled daily with the imperative to Read or Die. Yet what a relief to learn that it has all been unnecessary, that I can deep-six my reading glasses, leave books behind, and scamper at play in uncultivated sylvan fields. Further, as one who enjoys scratching paper with a pen, I can now forget about reading as a means of learning to write. 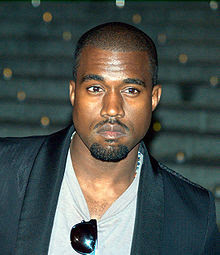 Though it’s unlikely he’ll actually read it, Mr. West has written a book. He is the co-author of "Thank You And You're Welcome." The volume is an in-the-backpack-sciatica-inducing fifty-two page tome with blank leaves (the ellipses of profound thoughts), and other leaves representing the foliage of his sunny psychotic optimistic philosophy of life. One two-page section, with plenty of blank space to provide intellectual context, reads, "Life is 5% what happens and 95% how you react!" Another page reads "I hate the word hate!" The weight of tautological guilt he bears must be a crushing burden. "This is a collection of thoughts and theories," West, 31, said in an interview about his spiral-bound volume, which was written with J. Sakiya Sandifer. West added that he put his thoughts in a book because "I get paraphrased and misquoted all the time." He calls his wisdom "Kanye-isms." "My favorite one is 'Get used to being used,'" he said. “If you can’t be used, you’re useless." The wisdom of angels. Next stop, Oprah. West, a college dropout, said being a non-reader was an advantage when he wrote his book because it gave him "a childlike purity." Ignorance has never sounded so appealing. Beyond the obvious, what is most disturbing about the music star’s statements is that there are many of his fans who will take his words to heart. There is a serious disconnect at work here. Studies have shown over and over that a rich intellectual environment and being read to as a child fosters a child’s interest in books and reading. West dedicated the book to his late mother, a university English professor before she retired to manage his music career, which begs the question, what was she reading to him?